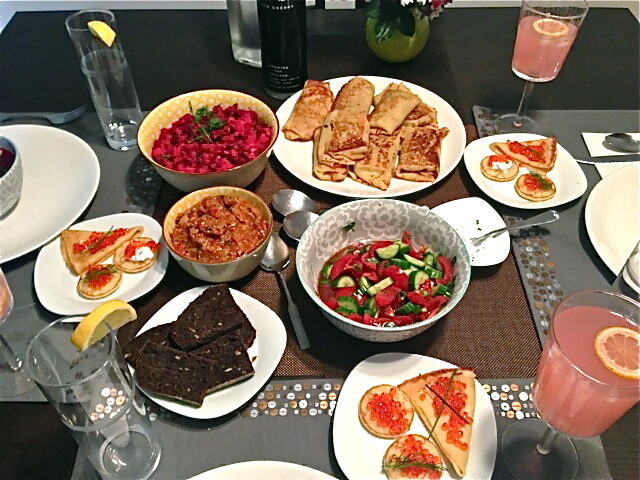 Traditional Russian meal and photo by Nat G.
Since the very first cooking class I ever taught, my absolute favorite part about teaching them is hearing from my students when they try their hand at the recipes they learn in class. It always makes my day to hear that they stepped out of their culinary comfort zone, and tried something new. I love getting the phone calls and facebook posts where they boast about successfully preparing a dish, or the ones where it didn’t go exactly as planned, but they think they know why. Yesterday, it was my turn to step out of my culinary comfort zone and experience a special first. One of my talented cooking class all-star students invited me and a mutual friend to her home for a traditional Russian feast. What a treat this was! First of all, I’m not particularly familiar with Russian cuisine, so it was certainly an educational experience. I’m always up for trying new things, and was excited that my entree to Russian food would come directly from an expert. Nat’s family is Russian, and as she says, she grew up eating caviar on crepes with her grandfather, so I knew I’d be in good hands. Secondly, despite the fact that I stress that I too was once a beginner, most of my students (and friends, for that matter) are too nervous or intimidated to ever invite me over for dinner. Vinaigrette – a cold beet and potato salad. 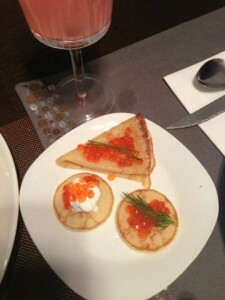 Yesterday’s meal featured a cold crimson borsch topped with a dollop of sour cream (which, I was informed, would be an interesting study on how quickly my digestive system works), followed by blinis and sweet crepes which acted as a vehicle for decadent pearls of carrot-colored caviar. 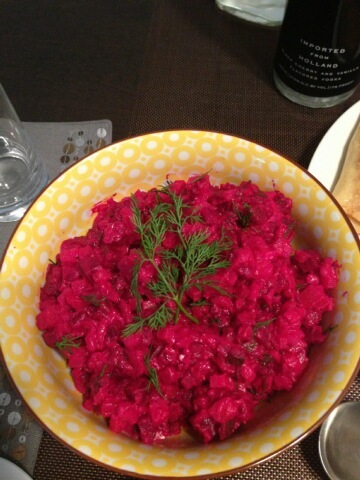 Next came vinaigrette, which is a beet and potato salad that would put your old picnic standby to shame. Then came a dish that looked familiar but offered an interesting surprise, blinchinki. 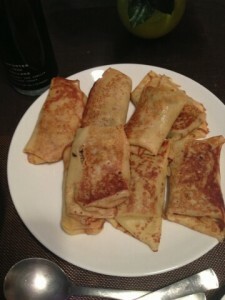 These savory blintzes filled with finely minced turkey, onion and egg were a highlight for me. Ikra followed, which was a smokey eggplant and roasted pepper dip that was spread on espresso-colored “Russian” bread, and reminded me a lot of babaganoush or caponata. Finally, Nat served a clean tomato and cucumber salad (which she noted was not Russian), in case we didn’t like the other offerings. We washed down this feast with vodka-spiked pink lemonade, and after a nice visit, dessert was served. Alongside our cups of coffee sweetened with condensed milk, Nat presented us with a traditional cookie, priyaniki. Alone, the hard-glazed priyaniki tasted great, but were a little dry, and as Nat explained, are specifically served with coffee or tea, to encourage dunking. I love dunking cookies. There’s simply no better way to eat a cookie than dunked. Second, she served a poppy seed loaf cake that reminded me of a chocolate babka, but instead of chocolate, there was sweet poppy seeds. As if that wasn’t enough, perfectly halved strawberries rounded out the meal. Nat paid a lot of attention to detail, as most of the savory dishes were garnished with sprigs of dill or fine stalks of chives, and it was very evident that she put in a lot of time and energy into making this meal really stand out. Binchinki, a savory blintz stuffed with seasoned ground turkey. I left Nat’s house with not just a full stomach, but a full heart, too. She completely outdid herself, and made me very proud. She certainly set the bar high! *Silly me, I forgot to bring my camera along, so Nat’s iphone had to suffice. Trust me when I tell you that the spread looked colorfully enticing and simply delectable. Several years ago, shortly after a good friend of mine got married, she and I began meeting in secret, so that I could help her figure out her way around the kitchen. We met once a month, perfecting an appetizer, soup or salad, main dish, and dessert each time, slowly building her personal repertoire of recipes. As she grew more confident in her own cooking style, she shared our little secret with some mutual friends, and seemingly overnight, my cooking classes grew. Me with my first cooking students, Robyn A. (left) and Lori L. (right). Since then, I’ve taught everyone from 3-year-olds making rainbow pizza (which is veggie pizza to the rest of us), to couples enjoying a date night, and young adults seeking to wow their Bubbes with traditional recipes for Jewish holiday feasts. With every new class, I find myself offering the lessons I have learned from previous generations in my family. And while techniques and styles have evolved, I thought I’d share 5 cooking tips that are timeless. 5. Keep it simple. Good food isn’t synonymous with thousands of ingredients and steps. Sometimes the most treasured dishes involve minimal effort, and focus on heightening a single flavor. For example, I remember the way my mouth watered when I first tried adding a pinch of salt to a slice of watermelon or a dash of chili powder to a piece of mango. See how the flavor intensifies when you squirt the juice of a lemon and sprinkle a bit of salt to some cucumbers. Trust me on that one. 4. Clean as you go. I often see new cooks get overwhelmed by the mess and pile of dishes that await them after a day of cooking. Take a second to wipe down the counter top while that cake is in the oven, or wash the dirty dishes when those veggies hit the grill. I even bring my sous chef (read: husband) along with me to my cooking classes at the temple, and he’s great about washing the dishes the moment they are no longer in use. The less work you have to do after you’ve finally enjoyed the fruits of your labor, the sooner you get to kick off your shoes and relax. 3. Invest in quality. I’m as much of a Frugal Frannie as the next girl, but there are certain items in which I am willing to invest. Knives, for example. You don’t necessarily need a whole set (although it doesn’t hurt to have one, but I know, I know… they can be expensive), just the essentials. Good knives can help take the load off, literally. Properly weighted, sharp knives should make your job easier, not harder, and should fit comfortably in your hand. Quality ingredients are also worth the investment of time and money. Head to your local farmers market to see what seasonal produce is prime for the picking. Often times, the prices are cheaper at these markets than they are at your jumbo stores, since you take away the cost of a middleman packager and any sort of travel. Plus, the produce tastes infinitely better, as it is picked at the peak of freshness often the day of the sale. These little choices make a big impact on flavor. After cycling through my bunches of cookie sheets, cursing the burnt bottoms they all left me with, I finally invested in a nice, insulated baking sheet, and have since kissed my burnt bottom confections good-bye. I learned that it is better to have one really strong, insulated baking sheet than ten flimsy ones that don’t do the job justice. In this case, I wish I had made that investment earlier. 2. Watch and learn. 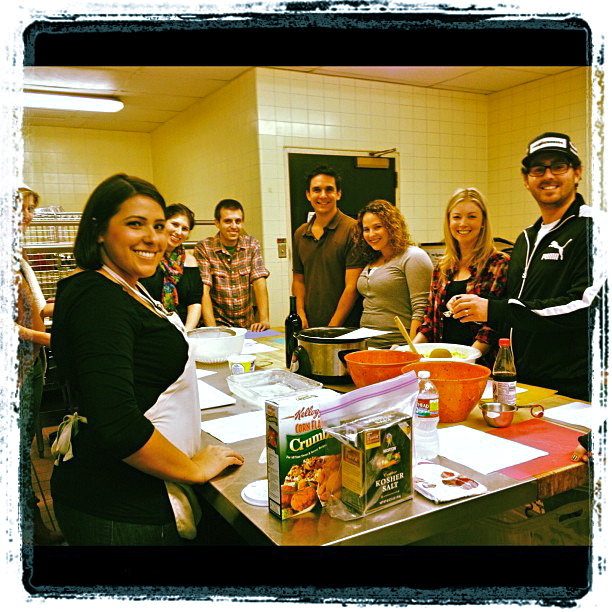 Cooking isn’t only learned through lessons at your local culinary school or from the famous chefs we see on the TV. 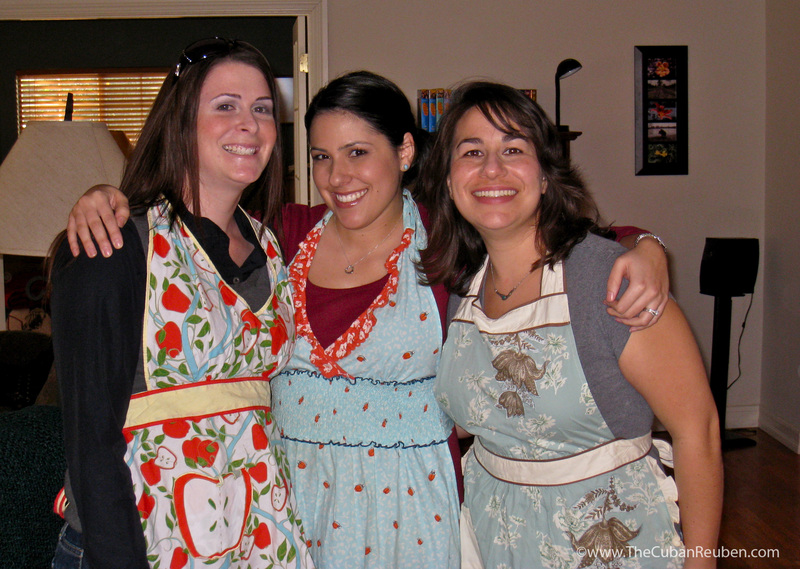 Pay attention to the known cooks in your circle of family and friends, as they prepare meals. Offer your help, and observe their cooking techniques. When you find yourself dining at a restaurant with an open kitchen, opt to sit at the counter, so you can get a good view. You’ll quickly learn that everyone has their own style, tips and shortcuts. The more time you physically spend in the kitchen, the more you’ll pick up. 1. Have no fear. The most important lesson I teach my students is that the only way to really learn how to cook is to not be afraid of making mistakes. It is in these mistakes that we learn what works and what doesn’t. Trust me, I have had my fair share of dud dishes (sorry, husband), but if I quit after each mistake, I wouldn’t have made all the fun culinary discoveries that I have made along the way. Much of great cooking has more to do with confidence than prowess. And confidence grows only with practice. Take risks. Try your hand at your all-time favorite recipe, and see how it goes. 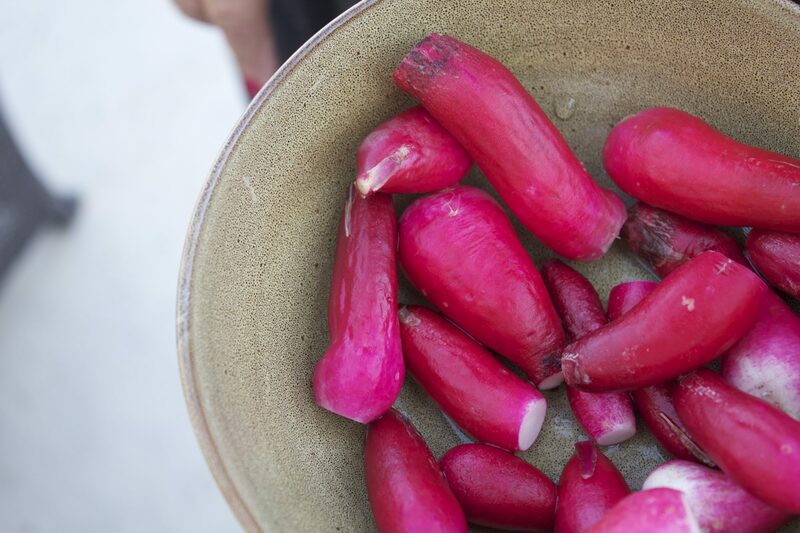 Choose an unfamiliar piece of produce at the market, and bring it home to experiment. You just might surprise yourself. Keep these tips in mind as you navigate your kitchen. Hopefully, they’ll help shed a little light on the situation, and give you the little umph needed to tackle that special recipe you’ve been dying to try.